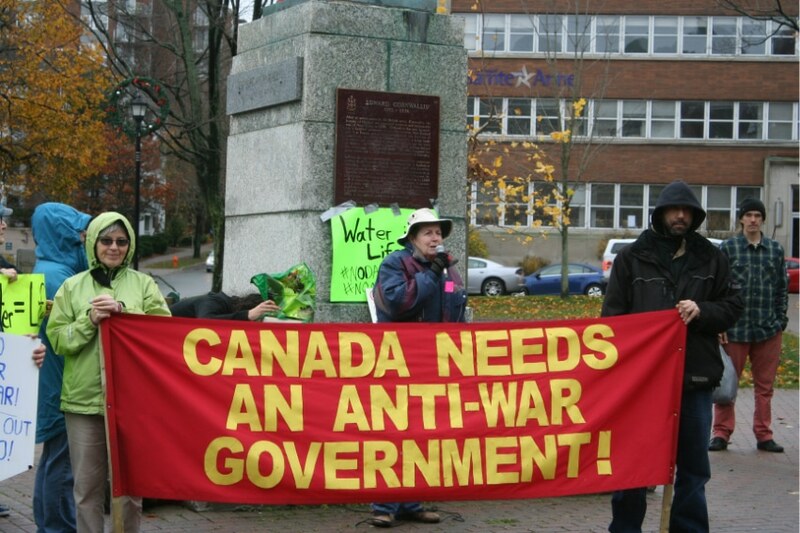 All out to oppose annual US-led war conference in Halifax! This year’s U.S.-led “Halifax International Security Forum” (HISF), referred to by many as the Halifax War Conference, takes place on November 16-18. An anti-war rally will be held to protest it on November 17. 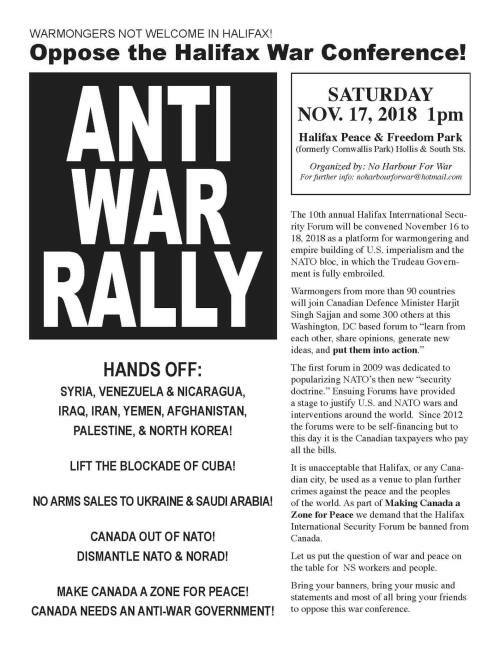 The 10th annual Halifax International Security Forum will be convened November 16 to 18, 2018 as a platform for warmongering and empire-building of U.S. imperialism and the NATO bloc, in which the Trudeau government is fully embroiled. The HISF is one of an international series of annual “security forums” organized in Munich, Berlin (Bundestag Forum), Kiev, Brussels, Tibilsi, etc., and on the sidelines of NATO Summits (Riga, Istanbul, Bucharest, etc. ), mainly by the German Marshall Fund of the United States. It was this agency that inaugurated the Halifax Forum in 2009, sponsored by NATO, as one of its programs. The “security forums,” though the particular agenda and themes change according to circumstance, serve as weapons for the U.S. government in its confrontation with the world that it strives to dominate. They are a specialized mechanism responsible for mobilizing high-ranking US, Canadian and international officials, especially military, and selected ideologues, journalists and organizations for hegemony and war. Despite the use of the name of our city, this forum has no organic connection with Halifax. Everything is organized from Washington, DC, where the HISF has established its headquarters since 2011 as a separate entity. Of its board of directors, not one is from the city of Halifax, let alone the province of Nova Scotia. Of the five members, four are citizens of the United States. By whom and how they were originally appointed is not publicly known nor are the funding arrangements. This is all secret. The first forum in 2009 was dedicated to popularizing NATO’s then new “security doctrine.” Ensuing Forums have provided a stage to justify U.S. and NATO wars and interventions around the world. Since 2012 the forums were to be self-financing but to this day it is the Canadian taxpayers who pay all the bills. It is unacceptable that Halifax, or any Canadian city, be used as a venue to plan further crimes against the peace and the peoples of the world. As part of Making Canada a Zone for Peace, we demand that the Halifax International Security Forum be banned from Canada. Let us put the question of war and peace on the table for Nova Scotia workers and people. Bring your banners, bring your music and statements and, most of all, bring your friends to oppose this war conference. In a radio interview on the Rick Howe Show on October 11, Bezanson elaborated why the presence of foreign warships in Halifax must be opposed and the dangerous nature of the U.S.-led War Conference. Both are examples of how Canada is at the disposal of U.S. imperialist aggression, he said. Halifax has one of the largest natural harbours in the world, which should be used to promote Canadian nation-building and peaceful relations and trade with all countries, big and small, based on respect for their sovereignty and mutual benefit, not as a base for war. He called into question the dogma that Canada should be a member of NATO, and that consequently Halifax should be made available to other NATO members – such as the recent visit of the French nuclear submarine FS L’Améthyste – regardless of the people’s opposition to Canada’s membership in NATO and its participation in war and aggression. Canada is not at war and only requires a coastal defence force, Bezanson said. Why does it participate in war exercises with NATO countries, and who are its enemies that it is doing so? Bezanson asked. Canada does not have enemies that would require it to take part in such exercises, he said. Regarding the Halifax War Conference, he noted that going by its agenda this year, the war conference is preoccupied with portraying Russia, China and the African continent as sources of aggression which pose a danger to Canada. He pointed to the large numbers of high-level military personnel and others who are brought to the conference in a manner which covers up that many of them are actually war criminals for the deeds they have already committed and all of them can be called war criminals for making plans at this conference which constitute crimes against the peace. In fact, this year’s conference will inaugurate an award called the John McCain Prize for Courage in Public Service to honour as a “moral beacon” the late U.S. Senator, nine time participant in the HISF, who was second to none in using the Halifax podium to champion wars of aggression against Libya, Syria and Iran. The conference has eight open sessions and 28 closed-door sessions where the public will not know what goes on, Bezanson noted. Depriving the public of information is done in the name of security and the national interest to make sure that no one gets a sense of the magnitude of the dangerous activities in which Canada is being embroiled and that anyone who opposes such a self-serving conception of both security and the national interest can be then criminalized as a danger to society. No Harbour for War opposes the use of Halifax to plan aggression and war. Bezanson pointed out that No Harbour for War opposes the war conference’s entire agenda. He highlighted one particular agenda item, “100 Years On: Are We Tired of Winning?” – a reference to the centenary of the end of World War One. The organization opposes the commemoration of this anniversary with militaristic propaganda. What such a topic really says is that we still live in a time of war between vested interests. Those involved in the conference have still not learned that the people oppose wars of aggression to take over the lands of others and to repartition their domains. These are wars of aggression and occupation to immiserate the peoples, he said. No Harbour for War is calling on everyone to oppose the Halifax War Conference. Haligonians must not allow them to speak in our name. 1.The German Marshall Fund (GMFUS), which has over $233 million in assets under management according to Bloomberg, provided funds and cadre for the series of “colour revolutions” in Yugoslavia, Ukraine, Georgia, Belarus, etc. Sometimes falsely described as a “philanthropic organization” by the media, it has played a central and calculated role in building international institutions and networks in Europe as an instrument of U.S. intervention and the expansion of NATO. In addition to its headquarters in Washington, GMFUS has seven offices in Europe: Berlin, Brussels, Paris, Belgrade, Ankara, Warsaw, and Bucharest. GMFUS has smaller representations in Bratislava, Turin and Stockholm. The German Marshall Fund is substantially funded by NATO bloc governments, and reflects their interests. The top two financial sponsors, at more than $1 million per year each, are the U.S. government’s soft-power arm the U.S. Agency for International Development (USAID) and the German Foreign Office (Auswärtiges Amt). The U.S. State Department also provides more than half a million dollars per year, as do the German Ministry of Economic Cooperation and Development and the foreign affairs ministries of Sweden and Norway. It likewise receives at least a quarter of a million dollars per year from NATO. In turn, NATO is a sponsor of the Halifax forum along with Northrup Grumman and Irving Shipbuilding. The GMFUS has close links to U.S. intelligence: for example, Suzanne Woolsey, the wife of former CIA director James Woolsey, who attended the HISF in 2009 and 2010 and was an adviser to Donald Trump, is a board member. GMFUS President Karen Donfried, member of the Council on Foreign Relations known as the imperial brain trust, worked for the U.S. State Department’s Policy Planning Staff from 2003 to 2005, then as the national intelligence officer for Europe on the National Intelligence Council and then at the National Security Council as a Special Assistant to the President in the Obama White House, and as the director of European affairs. 2.In 2009, U.S. Defense Secretary Robert Gates announced at the HISF that U.S. Marines would henceforth exercise in the Arctic to “defend Canadian sovereignty.” In 2013, his Defense Secretary Chuck Hagel announced at the HISF that Canada had signed a still secret protocol to join Obama’s Asia Pivot strategy aimed at China and the Democratic People’s Republic of Korea. There are no women on its board of directors. 3.Two of the five-member board worked for the GMFUS: Peter Van Praagh, who had organized the 2009 and 2010 forums for the GMFUS and was a former senior advisor to then foreign affairs minister Peter MacKay in 2006-07, was installed as president, and David Kramer, former deputy assistant U.S. Secretary of State, then a “fellow” of the GMFUS and at the time president of Freedom House, was installed as secretary. In 2016, Kramer, then with the McCain Institute, was involved in the dodgy “RussiaGate” affair at the Halifax forum. First of a series of investigative articles and reports published in cooperation with The Nova Scotia Advocate, on the occasion of the 10th anniversary of the HISF. (formerly Cornwallis Park) Hollis and South St.
Reproduced, with permission, from Tony Seed’s blog.